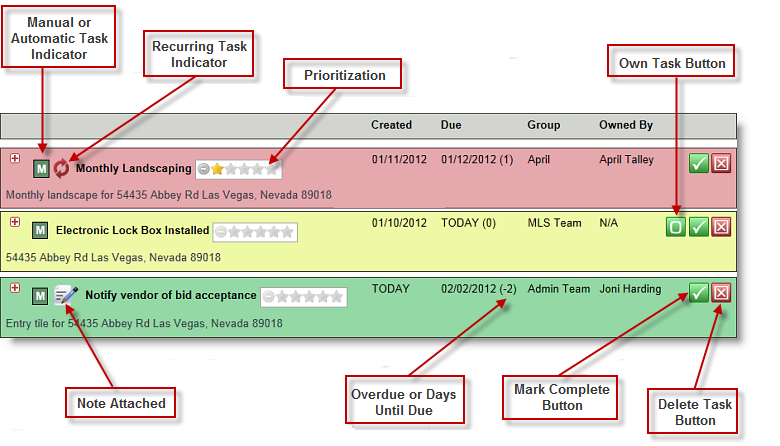 When viewing tasks, it is important to understand the meaning of the different icons and other information displayed. See the diagram below and the text following for a complete definition of each. + Icon - Note that each task has a + next to the task name. Clicking the + will expand the task to show task detail in a lower pane. Manual or Automatic Task Indicator - This icon indicates whether this task was generated as an Auto Task or if it was manually created. Recurring Task Indicator - If an auto task has been created to automatically occur repeatedly, this icon will appear on any task it generates. Prioritization - This shows the priority of the task. For information on how to prioritize tasks, see Prioritizing. Created - This column shows the date the task was created. Due - This shows the task's due date. Group - This shows which group owns this task. All tasks must be owned by one group. Owned by - This indicates the individual who owns the task. If the task has not been assigned to any one person, the Owned by field will show N/A. Own Task Button - This button will appear only for tasks that are not owned by any individual. Clicking this button allows you to take ownership of the task. See Un-owned Tasks for more information. Note Attached - This indicates that a note has been attached to the task. You can view the note by clicking the + next to the task name. The note will appear in a lower pane at the bottom of the screen. Overdue or Days Until Due - A number will be shown here in parentheses. If it is a positive number, (2) for example, it indicates the number of days overdue. If it is a negative number, (-2) for example, it indicates how many days you have left to complete the task before it becomes overdue. Mark Complete Button - Clicking this button will mark the task as complete, effective today. See Marking Complete for more information. Delete Task Button - Clicking this icon will permanently remove the task from the Broker Brain system. For more information, see Deleting a Task.